Spring has brought with it a ton of stormy weather this year. Rain was in the forecast for Easter day so on Saturday night I had the boys and their cousins put on their Easter shirts and we drove down to an old house (in the holler where Nan and Roscoe live) to go take some Easter photos. Of couse, Olan Mills quality these photos are not. The boys wanted every photo to be a funny faced photo and Ezra had this amazing ability to find a crazy new one at every snap. We have some new friends in town. Aaron and Tina and their sweet daughter Ayla moved here from Chicago in recent months to open a restaurant in the Red Rive Gorge of Kentucky. Tina is also a professional photographer. An uber-amazing photographer, in fact. She is one of these rare breeds that take photos with seemingly effortlessness. Otto's perspective on it all. Ezra taking a break to watch Tom and Jerry. She spent a couple of hours with us out at The Homestead a few weeks ago to document Canaan's marshmallow process. She was so quick in her movements with the camera, yet so calm. A few days later she sent along the proofs. 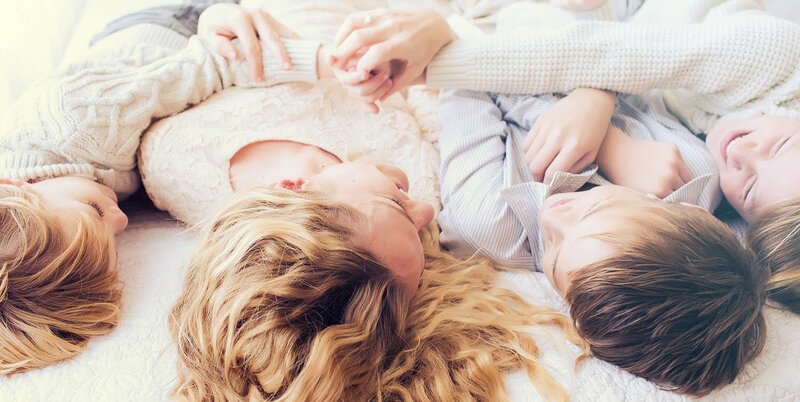 My jaw dropped to the floor as Mike and I saw the amazing way she really truly captured a-day-in-the-life of our family. Her company, Vrai Photography, is award winning...no doubt why. Her work is flawless. The spring of 2011 is shaping up to be quite a croquet kinda season. The croquet set I bought last fall at the thrift store is being put to great use both for a game of croquet and also deconstructed for golf ball mazes. I have lots of hopes and dreams for a garden this year which I am not sure will happen here at home, at a local community garden nearby, or out at The Homestead in a raised bed near the kitchen. Still weighing the pros and cons of all of that. Couldn't resist photographing the boys on the front porch Sunday afternoon. Canaan was helping Ezra memorize his Bible verse for the day. It was one of those rare moments that our 8 year old and 4 year old were working on something together without the sibling bicker. I had every intention of blogging throughout the week about our trip to the mountains ~ but alas, the weekend is here and I am just getting around to post #2. Things are happening at a rapid pace for the opening of The Homestead. I will share more about that next week. The mountains where my husband grew up are beautiful. I have shared many times about the beauty of those winding roads and how much I have fallen in love with that area in the past decade. But this trip back was a reminder that there are some harsh realities of these mountain areas. Extreme poverty and the rise of meth is prevalent and its affects can be seen everywhere. Before I was married, I was in full time training to be a tribal missionary. When I was 16 I took a six week trip to Papua New Guinea that forever changed the outlook I had on life and the course my life would take. As part of my 3 year training I spent a year on top of a mountain in eastern Kentucky. The base their in Cornettsville was an old orphanage that had been bought by the missions organization I was with. 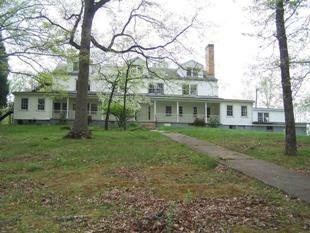 There were several staff houses on the property as well as a dorm/chapel and the original large orphanage home. A few years ago the mission sold the land to another non-profit that didn't last long. Since then we had heard the place had fallen into disrepair and I was curious to see what had happened to the property. Last weekend Mike, Canaan and I drove the long, winding, steep 1 mile trek up to the top. What we saw broke my heart. The orphanage (a beautiful stately white building)was burned to the ground. All that is left standing is the large brick chimney. The chapel was burned to the ground as well and the homes were ransacked and stripped of all copper, electrical and anything worth any value. I was sick to my stomach for hours after our visit as I thought about the senselessness of it all. The property had obviously been vandalized and the fire department has said that indeed the buildings were burned down intentionally. It is eery and a bit creepy, very sad and void of any beauty now. Things of this Earth are temporal, I know that, but its is heartbreaking to see what people on the wrong path in life can do. There are many wonderful memories created by thousands of people up on this mountain. Whether they were given a place to call home as a child or they were building homes in the woods in preparation for oneday building their tribal home ~ this place may be gone but not forgotten. It was a good lesson for Canaan about the affect bad choices can have. He made me chuckle when he said "yep..they were definitely doing drugs up here. I just saw a cigarette case!" A photo I found online of the original orphanage . No, this isn't The Homestead (our soon-to-be family store), but rather an old country grocery deep in the mountains of Eastern Kentucky, just at the mouth of Owens Branch Holler. The old grocery store was built in the 1930's. It is a rather large building with apartments above and below. Mike's parents lived in one of the small apartments when Mike's sister was born and when Mike's dad worked in the coal mine. A few years ago a family friend, Roscoe Shepherd, bought and began to run the old store. Roscoe has quite the story to tell of how he hit rock bottom financially prior to buying the store. He had just a few dollars in his pocket one evening as he drove to church and God led him to pick up a hitchhiker and buy him dinner with those last few dollars. He had just spare change left as he headed to church that night and tossed all that he had in the offering plate. Roscoe is a simple man with deep faith and obedience to what God asks him to do...such an amazing lesson for many of us to learn. God has certainly blessed his obedience and soon after he gave all he had, he was able to make enough money to buy the old grocery store and apartments. 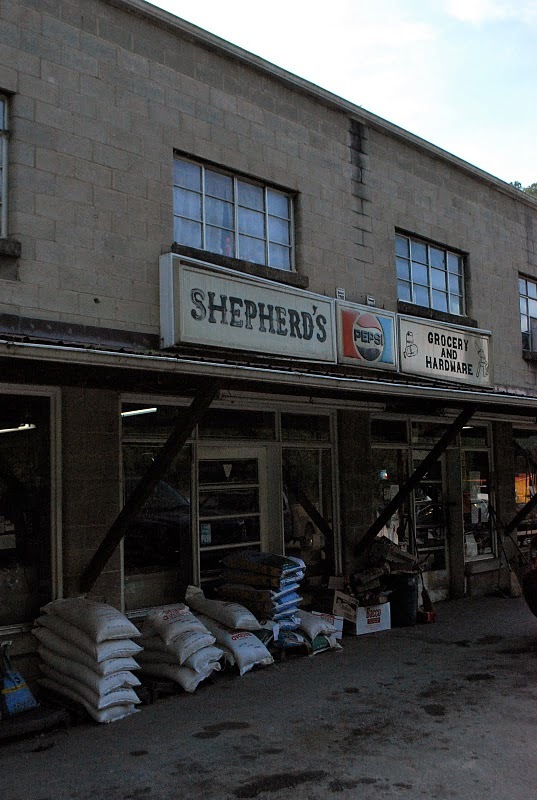 Today he still owns the store, called Shepherds Grocery, but leases it out for others to run. I imagine it hasn't changed much at all in the past 70 years. There is a cash register but next to the cash register is the old system of allowing the regulars to put their goods on their tab. The onion sets sit just below the candy. The pinball machine is plugged in right next to the nuts and bolts. Beyond the dog food and hardware section is a bed with a quilt on it. This is where Roscoe (and I suppose the new owners) would rest between customers. Driving past Shepherds Grocery you may think it is just a sweet little store that does just enough to get by. On the contrary. This humble grocery store thrives on the business of generations of families living deep in these mountain hollers. The closest Walmart is over an hour away for some so having the opportunity to buy a loaf of bread, feed for their farm animals or gas for their four wheelers they ride all up and down these mountain roads is essential to this mountain community. Today Mike's mom is married to Roscoe. Mike's dad, Lendell, passed away just months after we married 12 years ago. A little over a year ago Mike performed the ceremony at Roscoe and JoeAnne's wedding. It is a beautiful story really. Roscoe and Lendell were close friends that met at the coal mine and now years later Roscoe and JoeAnne can both reminisce about their memories and build new ones together.